The Boston Standard was named top title in Johnston Press at their company’s inaugural group-wide awards. The regional publisher decided to revive its company awards scheme last year after several years in abeyance with the event held at Peterborough’s Marriott Hotel last Thursday. Thirty-eight glass trophies were handed out at the ceremony which was attended by around 120 people. Other big winners included the West Yorkshire division which was named Publishing Unit of the Year while the Edinburgh Evening News was named Best Daily Title. 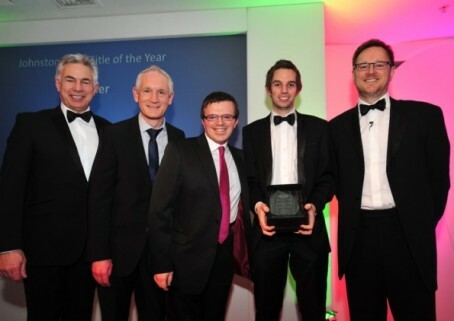 Boston Standard staff celebrate their win - from left, Richard Parkinson, managing director for JP Midlands, David Dawson, photographer, Andrew Brookes, deputy editor, Stephen Stray, editor, and Ashley Highfield, chief executive of Johnston Press. Chief executive Ashley Highfield and group commercial and marketing director Neil Jones presented the awards and bottles of champagne. Boston Standard editor Stephen Stray said: “I’m delighted for everyone associated with the Boston Standard and immensely proud of the team. Also among the winners was the Scarborough News which won the prize for Best Daily to Weekly following its frequency change last year. Recent ABC figures showed the News is now selling an average 14,806 copies compared to 9,914 in its last audited period as a daily. Publishing Unit of the Year: West Yorkshire. Award sponsored by SGP. Chief Executive Award (three recipients): Karen Prescott, North West sales administration manager, Catherine Grimwood, North West marketing manager, Claire Jones, administrator, Portsmouth Web. Award sponsored by Sun Chemicals. Wonder if they have awards in India for the best retail adverts, in-house promotions, features etc. ?